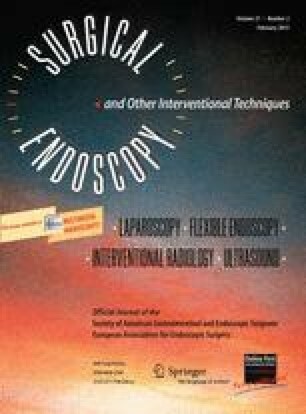 Compared with single-incision laparoscopy, multiport laparoscopy is associated with greater risk of postoperative wound pain, infection, incisional hernias, and suboptimal cosmetic outcomes. The feasibility of minimally invasive single-incision laparoscopic surgery (SILS) for colorectal procedures is well-established, but outcome data remain limited. Patients with benign diverticular disease, Crohn’s disease, or ulcerative colitis admitted to Klinikum Leverkusen, Germany, for colonic resection between July 2009 and March 2011 (n = 224) underwent single-incision laparoscopic surgery using the SILS™ port system. Surgeons had ≥7 years’ experience in laparoscopic colon surgery but no SILS™ experience. Patient demographic and clinical data were collected prospectively. Pain was evaluated by using a visual analog scale (0–10). Data were analyzed by using the SPSS PASW Statistics 18 database. The majority of patients underwent sigmoid colectomy with high anterior resection (AR) or left hemicolectomy (n = 150) for diverticulitis. Our conversion rate to open surgery was 6.3 %, half in patients undergoing sigmoid colectomy with high AR or left hemicolectomy, 95 % of whom had diverticulitis. Mean operating time was 166 ± 74 (range, 40–441) min in the overall population, with shorter times for single-port transanal tumor resection (SPTTR; 89 ± 51 min; range, 40–153 min) and longer times for proctocolectomy (325 min; range, 110–441 min). Mean hospital stay was approximately 10 days, longer after abdominoperineal rectal resection or proctocolectomy (12–16 days). Most complications occurred following sigmoid colectomy with high AR or left hemicolectomy [19/25 (76 %) of early and 4/5 (80 %) of late complications, respectively]. Pain was <4 on a scale of 0–10 in all cases on postoperative day 1, and typically decreased during the next 2 days. Our findings support the feasibility and tolerability of colorectal surgery, conducted by experienced laparoscopic surgeons without specific training in use of the SILS™ port. The authors take full responsibility for this article. The assistance of Esther Nathanson, Watermeadow Medical Inc., New York, is gratefully acknowledged. The preparation of this article has been supported by Covidien plc, Dublin, Ireland. Dr. B. Vestweber has received research grants and speakers’ fees from Covidien. Drs. Galetin, Lammerting, Giehl, Straub, Kaldowski, Alfes, Ms. Paul, and Prof. K-H Vestweber have no conflicts of interest or financial ties to disclose.